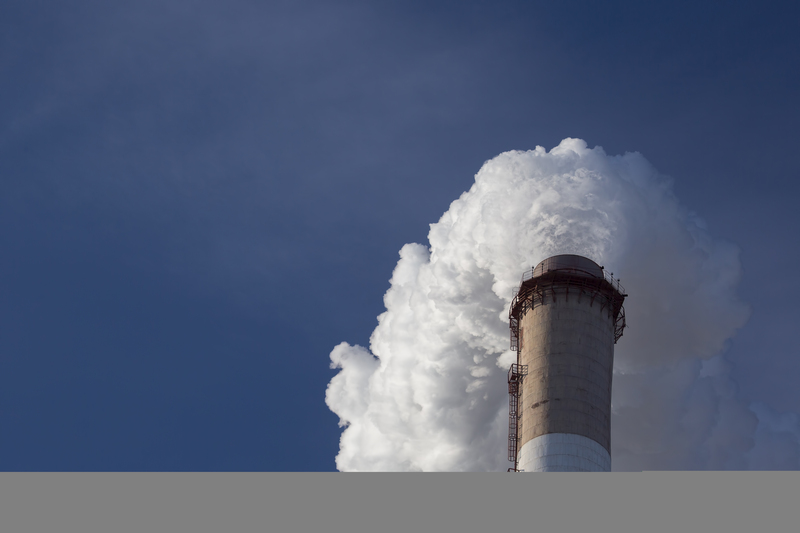 As the notion of ‘pre-industrial’ temperature levels already suggests, the industry plays a central role in rising emissions and therefore climate change. Indeed, the majority of developments of the past century that allowed for the contemporary way of life are hugely CO2 intensive. Giving up these gained comforts and lifestyles is not only an unpopular option, but would entail farreaching economic repercussions. As the notion of ‘pre-industrial’ temperature levels already suggests, the industry plays a central role in rising emissions and therefore climate change. Indeed, the majority of developments of the past century that allowed for the contemporary way of life are hugely CO2 intensive. Giving up these gained comforts and lifestyles is not only an unpopular option, but would entail far reaching economic repercussions. 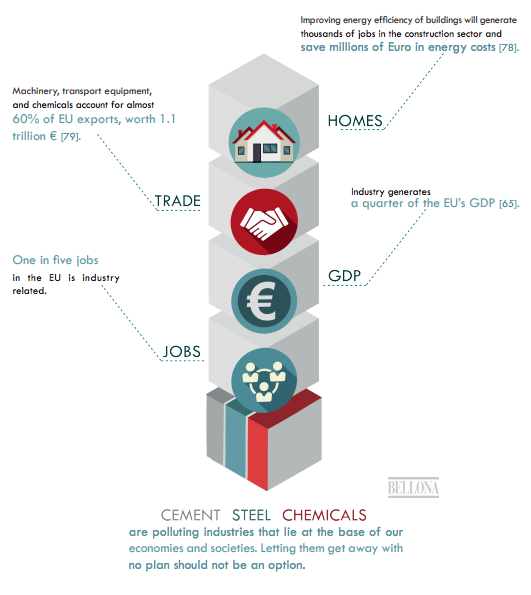 The industrial sector represents the foundation of Europe’s economic growth and welfare by generating about a quarter of the EU’s GDP, and providing 50 million jobs. In other words, every fifth job in the EU is industry related[i]. In Germany, the three most polluting industries – chemicals, cement and steel – emit almost 137 MtCO2 per year[ii]. This number is equivalent to more than half of Germany’s entire coal power emissions[iii]. The German chemical industry alone provides almost 450 thousand jobs and produces a turnover of over 188 billion €[iv]. 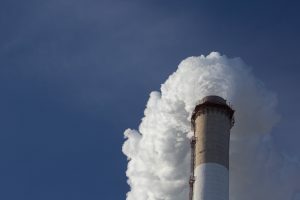 A European deindustrialisation due to mounting climate pressures to reach net zero would result in an immense loss of jobs, threatening livelihoods and the standard of living, as well as further macro-economic ramifications, including trade imbalances and resulting economic vulnerabilities. About 9 thousand jobs and a turnover of about 3.8 billion € depend on the elimination of each 1 million tonnes of CO2 that the Chemical industry currently emits[v][vi]. The case of the UK is a good example here, as the country underwent stark deindustrialisation since the 1980s[vii]. As a result, the UK depends largely on imports of manufactured products, resulting in a total current account deficit of over US$ 91 billion . This number already includes the UK’s surplus in services, meaning the actual trade deficit of manufactured goods is even higher. This point is particularly significant for Germany, whose economy depends on a vast industrial export sector that currently generates the world’s largest trade surplus, with an account surplus of US$ 296 billion (ibid.). However, the German export economy relies heavily (to 42%) on processed steel and metals that are worth some 506 billion €[viii][ix]. Without an industry sector, European economies would increasingly rely on services, making them vulnerable to volatilities on the market and developments beyond their sphere of influence[x]. An exodus of industries due to the failure to implement timely decarbonisation solutions would therefore hit the German economy hard, and, moreover would not necessarily reduce global emissions, as there is no guarantee that the now imported products have been manufactured carbon-free. On the contrary, this exodus is likely fuelled by less stringent carbon requirements elsewhere leading to what is known as carbon leakage. In fact, demand for products such as steel, chemicals, and cement is unlikely to disappear. Cement, for example, is a fundamental feedstock of development and infrastructure projects, as well as essential for extensive downstream use. Across Europe, the lime and cement sectors (lime is the essential ingredient in making cement) generate over 72 thousand direct jobs, and another 365 thousand indirectly just related to cement production[xi]. Over 305 thousand of these jobs relate to the production of concrete that is supplied primarily to the construction sector which itself generates about 9% of European GDP and accounts for 18 million jobs[xii][xiii]. In Germany, industry clusters associated directly with cement production provide 80 thousand jobs[xiv]. The looming shifts in economic activity if climate inaction is continued would also reduce government revenues significantly, as portions of wage, corporate and turnover tax money are set to be lost, paired with the danger of rising social welfare costs as unemployment rates increase. Together, in 2017 these three tax sources provided about half of total German tax revenues, or about 330 billion €[xv]. An additional knock-on (or rather -out) effect is likely to be on European research. Innovation is fundamentally driven, and often financed, by businesses. With over US$ 200 billion in 2015, Europe boasts the largest R&D expenditures worldwide[xvi]. Yet even if research and development continues in Europe, it would either remain shelved in its ivory towers or monetised in industries abroad. Europe would then import the products of its own innovation. It is thus key to ensure that the transition to decarbonise industries is done in such way not to compromise Europe’s competitive advantage in key sector’s, whilst ensuring it develops and implements new low carbon technologies and making the value chain more sustainable. This will allow the EU to achieve a carbon neutral industry sector before or in 2050 and ensure a brighter future for our children. [i] European Commission, “Industry Europe. Facts & figures on competitiveness & innovation,” 2017. [iv] Destatis – Statistisches Bundesamt, “Genesis – Statistics by Theme,” 2018. [Online]. Available: https://www-genesis.destatis.de/genesis/online;jsessionid=9B93D57338FF4C19E6A23A49F8CC7A4F. tomcat_GO_1_3?operation=previous&levelindex=2&levelid=1515409668053&step=2. [vi] EEA, “Total greenhouse gas emission trends and projections,” 2017. [Online]. Available: https://www. eea.europa.eu/data-and-maps/indicators/greenhouse-gas-emission-trends-6/assessment-1. [viii] World Trading Organization, “Country Profile: Germany,” 2017. [Online]. Available: http://stat. wto.org/CountryProfile/WSDBCountryPFView.aspx?Language=F&Country=DE. [ix] Destatis – Statistisches Bundesamt, “Genesis – Statistics by Theme,” 2018. [Online]. Available: https://www-genesis.destatis.de/genesis/online;jsessionid=9B93D57338FF4C19E6A23A49F8CC7A4F. tomcat_GO_1_3?operation=previous&levelindex=2&levelid=1515409668053&step=2. [xi] European Commission, DG Growth, “Cement and Lime,” 2018. [Online]. Available: https://ec.europa. eu/growth/sectors/raw-materials/industries/non-metals/cement-lime_en. [xii] European Parliament, “Smarter and more energy-efficient buildings in the EU by 2050,” April 2018. [Online]. Available: http://www.europarl.europa.eu/news/en/press-room/20180411IPR01516/smarterand-more-energy-efficient-buildings-in-the-eu-by-2050 . [xiv] VDZ, “Beschäftigung und Ausbildung in der Zementindustrie,” 2018. [Online]. Available: https://www. vdz-online.de/zementindustrie/branchenueberblick/entwicklung-der-zementindustrie/. [xv] Bundesfinanzministerium, “Die Steuer¬ein¬nah¬men des Bun¬des und der Län¬der im Haus¬halts¬jahr 2017,” 2018.